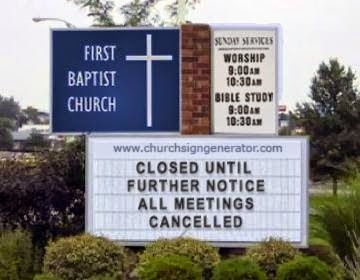 Churches are closing all over the United States. I’m not referring to the “Big C” church, as we know that the Church is actually the Body of Christ comprised of all believers in Jesus regardless of location, race, denomination, language or tradition. Worldwide, Christianity is not only the largest religion but also the fastest growing religion. What we are seeing in America however is that many local church congregations, some in nice buildings, some in buildings that have seen better days, are closing their doors each year. According to recent reports about 4,000 church congregations close each year contrasted with about 1,500 new church starts resulting in a loss of about 2,500 congregations. Considering a growth in the population in the United States of about .7% and if 40% of Americans regularly attend church, we need 4,200 net new churches every year. It’s becoming increasingly clear that each year a greater percentage of Americans are now ‘unchurched’. While the reasons for this are varied the undisputed fact is that as Christianity has become less relevant in the eyes of the average American. As a result more and more local churches are faced with very difficult decisions regarding their continued operation, their ability to attract new people and their continued role in the community. While they are still meeting and the lights are still on, these congregations have the opportunity to revitalize their ministry and to again be an important part of the fabric of their community. The Great Commission of making disciples of Jesus Christ is not just about reaching new people groups or something that growing and sprawling mega churches do, it’s the basic and the essential mission of every local church. Rather than abandoning these ministries and hoping that either the buildings can be sold, torn down or otherwise recycled, we need to remind ourselves that there is hope. Not only is Jesus still the Lord and Head of the Church, we as the Body of Christ likewise can come alongside these churches and provide them with opportunities to rejuvenate and rebirth their congregations. My observation is that these local congregations start spiraling down and get caught in a number of ultimately fatal traps. Unless the leadership of the congregation recognizes the trends and understands that unless things change radically, their fate is sealed. The congregation, the building, the legacy and the local Christian witness will vanish. The challenge is that the change that is necessary is often very difficult to initiate. In every generation local churches have struggled when they make even minor changes in worship, preaching style, the environment, attire or service times. Recently many churches have stepped away from the traditional service patterns of Sunday morning, Sunday evening and Midweek as American culture has become busier and attendance has been declining. If your local church is thriving and prefers more traditional worship and midweek services, God bless you. Many congregations believe their culture and traditions are very closely related to their doctrinal beliefs and would rather be satisfied ministering to a declining and likely aging population. However, they and the community they serve may be missing out on an opportunity to understand and witness first hand that the Gospel is not limited by tradition and culture. Today more than ever we need more of our leaders to be like the Apostle Paul. While Paul was a great church planter and was used by God to bring the Gospel to the gentiles in Asia and Europe he was also interested in strengthening and revitalizing the existing churches. In the book of Acts we see Paul and Barnabas returning to the churches to “see how they are dong” (Acts 15:36).” Paul was not hesitant to address moral or theological issues, heresy or problems in leadership. Jesus through His angel sent messages to seven churches in the Book of Revelation. These churches were all unique and each needed to hear a unique message regarding insights into their ministry. Some were commended while some were severely criticized. They all had the opportunity to be faithful to the ministry that they were given. For most of them however that meant they had to make changes. The bible is clear that we are the Body of Christ and that when one member suffers, we all suffer (1 Cor. 12:26). We are all too familiar with the scandals that spread when a minister falls because of moral failure. Likewise, churches that begin to embrace the very sin that so easily entangles very quickly bring shame, dishonor and confusion within the Body of Christ. In the same way, churches that close their doors, sell their buildings and abandon their calling indicate failure. Their failure means that the message of the church, the life-changing opportunity to embrace Jesus as the Christ, to have sin forgiven and provide a message of hope is somehow irrelevant. I mentioned earlier that many of our local congregations are spiraling down and get caught in a number of ultimately fatal traps. Often before a church can be revitalized, it has to be pruned and closed temporarily for some major remodeling. Like an airplane that goes into a stall and starts spiraling down, the very deliberate but often counter intuitive maneuver of pushing the nose down is the only thing that can stop the spiral down. 1) Sever the denominational ties! If you can’t completely depart from the denomination change the name on the building so that the message is clear that the purpose and mission of the local congregation is not about denominational differences but about the essential message of the gospel. 2) Focus on the local community! Local congregations are designed to serve the local community. People within a few miles of the church need Jesus and having a local church provides great opportunities for fellowship and true communion. 3) Worship! All too often we worship our worship rather than worship the Creator. There has been more hand wringing and arguments over the style and type of worship in a church than any other issue. Worship preferences are rarely doctrinal issues and Christians have worshiped God in many different manners over the past 2,000 years. 4) Preach the gospel! As churches become smaller the preacher assumes that since the remaining people already know the gospel, they need to be given other lessons in stewardship, parenting, ecology, history, social services or other useful but nonessential messages. It is the gospel that brings spiritual rebirth and it is the gospel that people need to hear. 5) Evangelize! Evangelism is not a program nor an annual outreach, nor even an option; it is a command. Evangelism is just another term for our part of the Great Commission, as it was Jesus that said to go and make disciples. We go, He brings the Holy Spirit. 6) Pray! It is Biblical and it has also been show historically that there are no second generation Christians. Every believer begins his or her walk with the Lord individually. Christianity is about prayer, self-sacrifice, humility, discipline and the development of a personal relationship with God through Jesus Christ. March 21, 2011, Failed Bomb blasts in Jos Nigeria as genocide of Christians continue.